We thought this quote was pretty fitting for this innovative engine design by LiquidPiston. They’re completely re-thinking the engine by making it ten times lighter and smaller than a conventional diesel engine without compromising any torque. 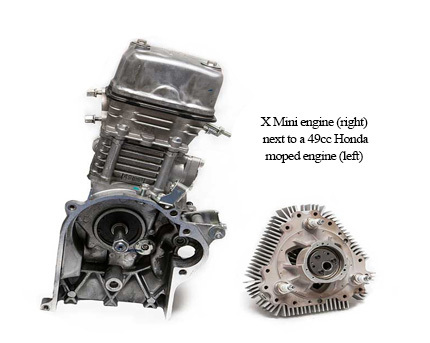 This innovative “X Engine” & “X Mini” have a high efficiency hybrid cycle with three combustion events per rotor revolution. The result? Tremendous power density! The thermodynamic cycle and engine architecture significantly improves efficiency, weight, size, vibration and noise. To demonstrate the technology, Liquid Piston has used a small vehicle (go-kart) engine to test and refine the capabilities. Watch the video below for a visual demonstration of the functionality. In it you will also see the shroud around the engine and fan that were 3D printed by Synergeering with a GF-Nylon material and post processed so that it was air and liquid tight to be able to withstand the engine environment. The “X-Engine” & “X Mini” are suited for a very diverse line of applications that require power-dense, low-vibration, quiet efficient engines. Made possible with multi-fuel capabilities and scalable from 1HP to over 1000HP. This includes handheld power tools, portable generators, mopeds, unmanned vehicles, marine power, robotics, aviation, etc. The Connecticut based company has been working with numerous partners for specific market applications and most recently caught the interest from the U.S army with a $3 million deal towards development of a 2kW diesel generator as a solution for powering various military and non-military applications. This was in conjunction with their current $2.5M deal with DARPA for projects including developing a 40HP version of the engine which would be their second award DARPA has made to Liquid Piston in the past 18 months. We can’t wait to see what LiquidPiston will come up with next!